Ark Sale is on with 20% off your holiday essentials! Shop today you don't want to miss it! Based in the United Kingdom, for over 20 years Ark has sold a range of clothes for young, fashion-forward men and women. 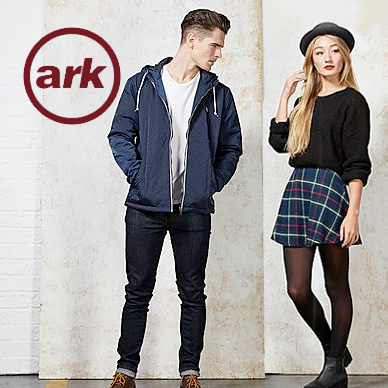 Ark.co.uk sells garments for every event, from tartan trousers to cute kimonos. As well as clothing, Ark stocks accessories including watches, jewellery, bags, wallets, hats and sunglasses. Popular brands include Fred Perry, Casio and Criminal Damage, but a shopping spree at Ark won't break the bank! With just a few clicks around their mobile-friendly website, you can stock your wardrobe with style for every day of the week - often with up to 75% off in the sales! Add Ark to your Favourites list and be the first to know every time they have a Sale on! 1st January 2018 - Ark New Years Day sales for 2018. 7th May 2018 - Ark Early May Bank Holiday sales for 2018, add to your diary now! July 2018 - Ark Summer 2018 sales, joining us? 23rd November 2018 - Ark Black Friday sales in 2018 start on Friday 24th November. Add products from Ark to your Love Sales list. Get the Love Sales button now! Ark January Sale is on with 20% off your holiday essentials! Shop today you don't want to miss it! Ark Boxing Day Sale is on with 20% off your holiday essentials! Shop today you don't want to miss it! Ark Christmas Sale is on with 20% off your holiday essentials! Shop today you don't want to miss it! Ark Cyber Monday Event is now on across selected items. Plus for a limited time only get free delivery! Ark Black Friday Event is now on across selected items. Plus for a limited time only get free delivery!